O.U. 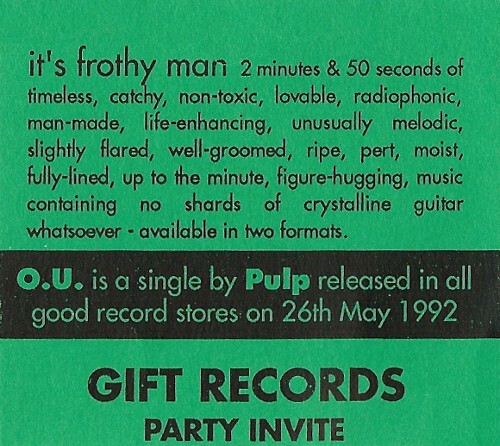 was the first single to be released on the Gift Records label in 1992. Gift was to be an indie offshoot of the dance orientated label Warp. 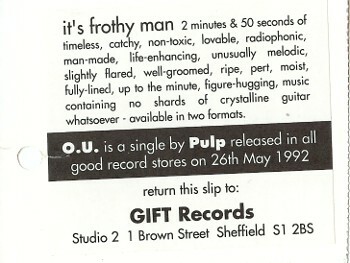 The record was released despite the fact that Pulp were still signed to Fire Records. Pulp's relationship with Fire had broken down irreparably by this time and there seemed almost no prospect of releasing new material through them. Fire were after all still to release the Separations LP, which had been recorded two and a half years before. The band's sound had moved on considerably since then and they were desperate to get some new recordings out: in part in the hope of attracting some interest from a major label. They calculated that Fire would not think it worthwhile to take legal action against a small independent label. 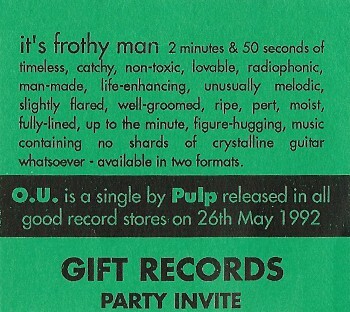 Copies of this single are now quite rare. However, all the songs, except for the radio edit of O.U., can be obtained on the Intro: The Gift Recordings compilation that was released in 1993. O.U. 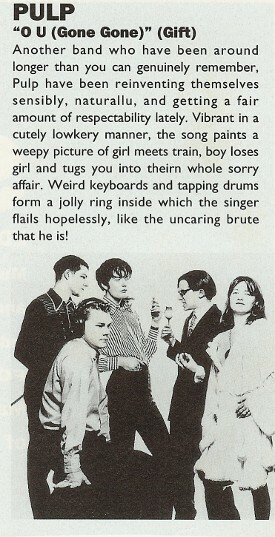 re-uses the chord structure of Pulp's 1986 b-side 97 Lovers. The radio edit of O.U. features a shortened intro. it's frothy man, 2 minutes & 50 seconds of timeless, unconditionally guaranteed, perfectly formed, catchy, non-toxic, lovable, sexually enlightened, 150 B.P.M., radiophonic, stylophonic, stereophonic, man-made, organic, life-enhancing, fast'n'loud, brand new, frantic, overwrought, unusually melodic, slightly flared, well-groomed, irresistible, ripe, pert, tight as, arousing, seductive, moist, fully-lined, up to the minute, fashionable; durable, well-designed, figure-hugging, gripping music containing no shards of crystalline guitar whatsoever - available in three formats; super duper. In France they ask "Where?" We finally decided to leave Fire, and recorded "O.U." and "Space" early in 1992, with Simon Hinkler. It didn't turn out very well, so we used Ed Buller to remix it. I'd heard his production on the Spiritualised LP and he sounded able to work with keyboards, rather than concentrating on guitars. We were very impressed - he transformed the song. "O.U." became our first release on Gift Records. It was a Sheffield label, and we knew the people - they also run Warp. To promote the single 1000 helium balloons were released from Devonshire Green in Sheffield. 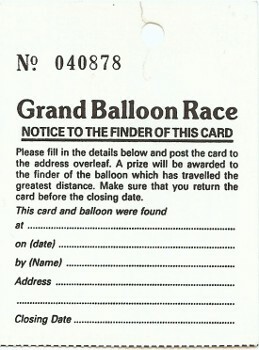 The balloons had tags attached for people to return with the promise of prizes for the ones found in the most distant or unusual locations. 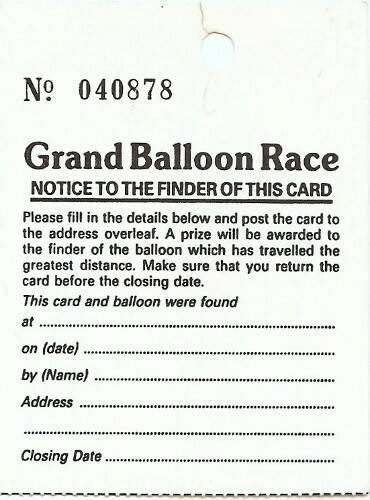 As well as prizes for the balloon tags returned from the most unusual or far-flung locations, there is also a tour competition. Each night a different password will be displayed behind the T-shirt stand. The person who writes in with the most number of correct passwords will win a special prize. This is colossal. And already I'm torn between these two inspirational records. Oh hell, be unfaithful to both of them simultaneously. Move to a love nest on the sea-front and see them on alternate evenings. And have Thursdays off to get your hair done. "O.U." (Oh you? Open University?) is three minutes of staggering popgasm. Sharing a similar disdain for the age as Suede (which, of course, makes it feverishly modern) its prime difference is that it is out of control. Jarvis Cocker's love-life brims, it seems, with the elation that comes with phenomenal doubt, pain and failure. 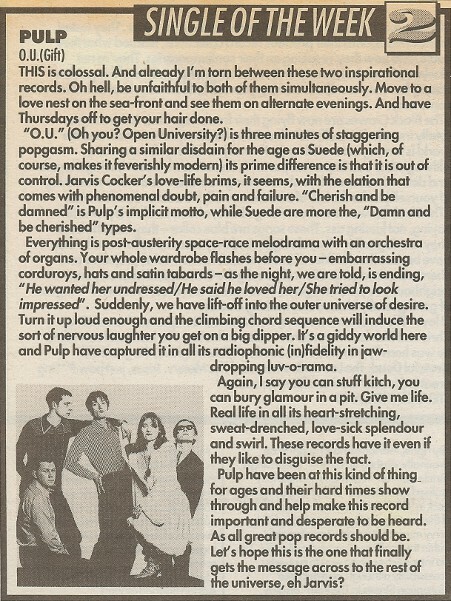 "Cherish and be damned" is Pulp's implicit motto, while Suede are more the, "Damn and be cherished" types. Everything is post-austerity space-race melodrama with an orchestra of organs. Your whole wardrobe flashes before you - embarrassing corduroys, hats and satin tabards - as the night, we are told, is ending, "He wanted her undressed/He said he loved her/She tried to look impressed". Suddenly, we have lift-off into the outer universe of desire. Turn it up loud enough and the climbing chord sequence will induce the sort of nervous laughter you get on a big dipper. 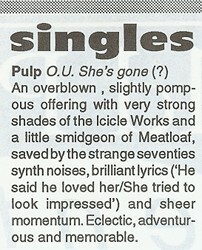 It's a giddy world here and Pulp have captured it in all its radiophonic (in)fidelity in jaw-dropping luv-o-rama. Again, I say you can stuff kitth, you can bury glamour in a pit. Give me life. Real life in all its heart-stretching, sweat-drenched, love-sick splendour and swirl. These records have it even if they like to disguise the fact. Pulp have been at this kind of thing for ages and their hard times show through and help make this record important and desperate to be heard. As all great pop records should be. Let's hope this is the one that finally gets the message across to the rest of the universe, eh Jarvis? 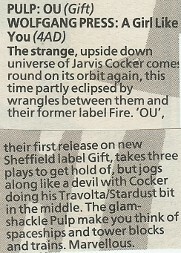 The strange, upside down universe of Jarvis Cocker Comes round on its orbit again, this time partly eclipsed by wrangles between them and their former label Fire. 'O.U.' their first release on new Sheffield label Gift, takes three plays to get hold of, but jogs along like a devil with Cocker doing his Travolta/Stardust bit in the middle. The glam-shackle Pulp make you think of spaceships and tower blocks and trains. Marvellous. Another band who have been around longer than you can genuinely remember, Pulp have been reinventing themselves sensibly, naturally, and getting a fair amount of respectability lately. Vibrant in a cutely lowkery manner, the song paints a weepy picture of girl meets train, boy loses girl and tugs you into theirn whole sorry affair. Weird keyboards and tapping drums form a jolly ring inside which the singer flails hopelessly, like the uncaring brute that he is! The World Of Pulp is a mighty strange planet. Filled, as it is, with the kind of noises which would embarrass a Clanger and pet trouserwear that should have been put down years ago, it's perhaps unsurprising that its five-strong population should spend their time worshipping the Great God Velour and making records like this. Odd is too small a word for 'O.U'. Irritating, hilarious, inspiring, camp are all larger and much more suitable. That godawful synth riff! That nerve-shattering violin noise! Those ace lyrics! 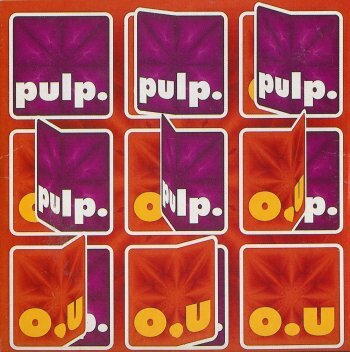 A Pulp record is like going to the dentist: you squirm and protest but you know it's good for you in the long run. The B-side, 'Space', features Jarvis mumbling about touching stars and travelling at the speed of thought. Have a quick rinse with the pink stuff and go home smiling. An overblown, slightly pomp­ous offering with very strong shades of the Icicle Works and a little smidgeon of Meatloaf, saved by the strange seventies synth noises, brilliant lyrics ('He said he loved her/She tried to look impressed') and sheer momentum. Eclectic, adventur­ous and memorable.